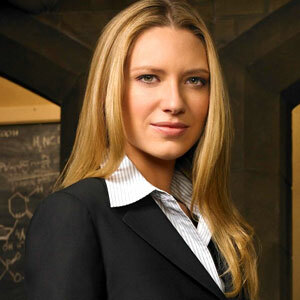 This week’s Danger Gal Friday is FBI Special Agent Olivia Dunham played by Anna Torv from Fox’s new Science Fiction TV show Fringe. One aspect I have so far enjoyed about Fringe is that Dunham is our main protagonist. She’s the center of the action and not a sidekick. While Dunham has her problems (a horrible step-dad, falling in love with her off-limits partner), we also see how she excels. We get to see a mix and balance of the negative and positive forces in her life. This makes for a multi-dimensional character. From a Gaze standpoint, I’ve also noticed that Dunham dresses in suits and simple t-shirts, we’re not seeing her body objectified by outfits an FBI agent just would not wear. Actually, it seems like Dunham’s black suit attire is meant to evoke a “Men In Black” vibe, or it could simply be that a woman with her background and profession likely would have a “uniform” similar to that. If the attire is due to the former, that’s a fun twist on a stereotype that I haven’t seen since Linda Fiorentino and Rosario Dawson in the Men In Black movies. If her attire choices are due to the latter, that seems to fit what I would expect from Dunham’s character. Dunham is not in a “girly headspace,” and I just don’t see many of the typical feminine trappings appealing to her. Dunham’s one assent to femininity is her long hair. Again, this seems to fit the character the writers have created. It’s a compelling mix of the practical with the impractical. In the series premiere, the plot did call for Dunham to strip down to her skivvies, but no special emphasis was placed on this. In a later episode we see Peter Bishop, played by Joshua Jackson, in his boxers somewhat gratuitously (Pacey, all grow’d up), so I feel there’s an even treatment so far across the genders of the main characters. I also like that they’ve teamed up the crazy old white mad scientist man with a Black female lab assistant whose character seems to be treated as much more than window dressing. Dunham’s character is also active in that she’s not only investigating intellectually into cases, but we get to see her in physical foot and car chases. We get to see her pull and fire a gun. In that last episode “The Cure,” we see her leading a SWAT team intent on rescuing a woman undergoing a tortuous medical treatment. So far, I have overall found Fringe to be a fun hour of entertainment. Some of the science in the show seems way more out there than what I’d even call “fringe,” but I have so far been able to suspend my disbelief and enjoy the show. So far I’m loving Fringe, a great mix of quirky (TV) science, characters that seem to have depth, good pacing, and interestingly enough some really great humor (mostly from the mad scientist). Also, the programmer loves this show, and he usually doesn’t go for my more sci-fi interests (with the exception of Eureka). I’ve definitely noticed her outfit b/c it is believable, unlike some of the frilly things the women wear on the CSIs. Let me just break out my winter white suit and chunky necklaces when I need deal with a decomposing body in a sewer. You have to like a show that has a cow as a cast member (hasn’t missed an episode either). Glad they made the shift so that Peter excepts his role instead of all that whining he was doing. I wish I had the opportunity to watch this show because I loved your breakdown of her suit! Maybe I’ll catch the show *and* the suit on DVD…. Yep, this post is way after the fact, I stumbled across this while researching Anna Torv. FWIW, from this guy’s perspective, Torv’s character in Fringe is incredibly attractive, she’s gorgeous — physically, emotionally, intellectually. Your comment about her hair is what prompted me to leave a comment — Although I think Torv has amazing hair, I disagree that feature is her one ascention to femininity. That said, I’m left wondering trying to figure out what you feel femininity means… at least where this post is concerned. Then again, I’ve had the opportunity to watch a lot of episodes that hadn’t aired when you posted that… Rather than type a ton to back up my points (tho’ I’m happy to if you like), I generally agree with you that Torv’s character on Fringe is very well balanced… if I could find a real life version of Torv’s character, I’d be a happy camper. Thanks for stopping by, Sean. We do know now that (spoilerish, I suppose if you haven’t seen all the episodes) Olivia’s penchant for gray and black suits is due to the tamoxiphan experiments she was part of as a child. Because Torv is made up to appear as if she isn’t wearing makeup as well as other wardrobe choices, I stand by my comment about her hair, but your question is a good one. What do I think femininity means? The Danger Gal posts are all about was society thinks femininity means vs. how female characters are portrayed. The DG posts are meant to highlight characters who go against those stereotypes. So, I think femininity means different things to different people and part of my blog’s reason for being is exploring that. The Gaze posts are sort of meant to explore the same concept with male characters. For me, femininity is not about long hair, but for society it often is. I mean, how many Victoria’s Secret models have hair shorter than their shoulders?